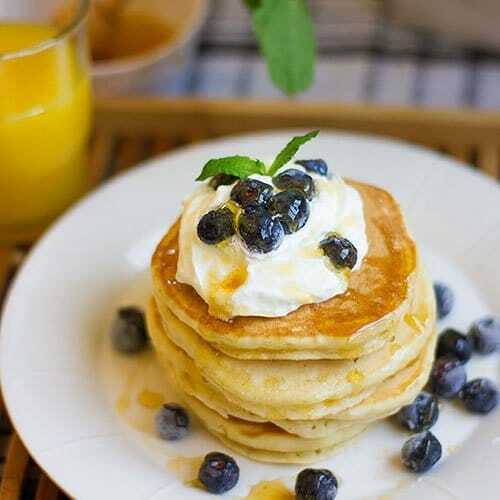 Usually, we make pancakes using milk, but you can get fluffy and delicious Yogurt pancakes too using plain or flavored yogurt, and in this post, you will learn how to make some. I was hesitant when I tried this recipe the first time, but now it’s the recipe I love for making pancakes beside my sour cream pancakes. 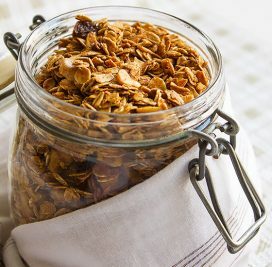 I have used plain, unsweetened, and regular yogurt for this recipe, I know there are recipes on using Greek yogurt out there on the internet so that you can give that a try too. You can try your hand on flavored yogurt but adjust the sugar in the recipe if the yogurt is sweet. 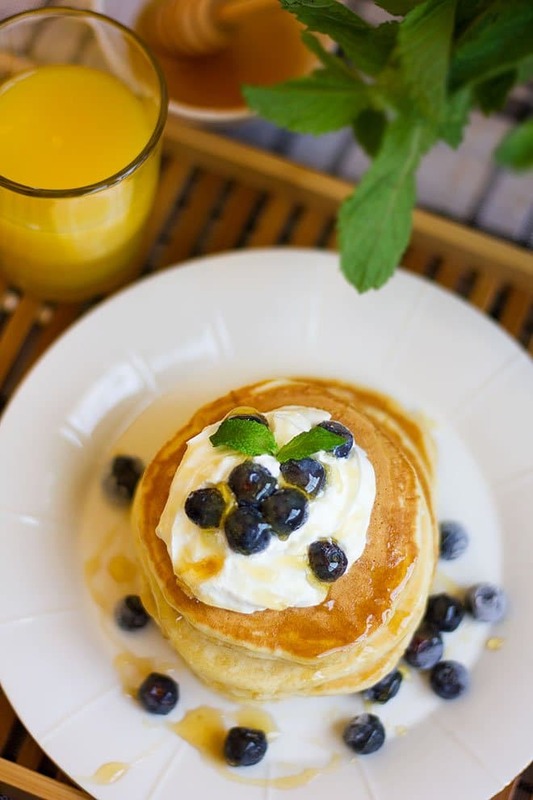 Yogurt is thick, so in this yogurt pancake recipe, I have added water to make pouring of the batter easier. In a mixing bowl, add the dry ingredients except for sugar and sift. Sifting the flour makes the pancakes lighter, and the batter will have fewer lumps. Beat the wet ingredients with sugar for a few minutes until the sugar dissolves and then add the dry ingredients to the wet and mix gently. When making pancakes we tend to overbeat the batter because of the lumps, but you should stop yourself from beating the batter until the lumps disappear. If you are a busy person who happened to love pancakes, you can freeze them. It is better to freeze the pancakes than refrigerate them. Fridge dry the pancakes. 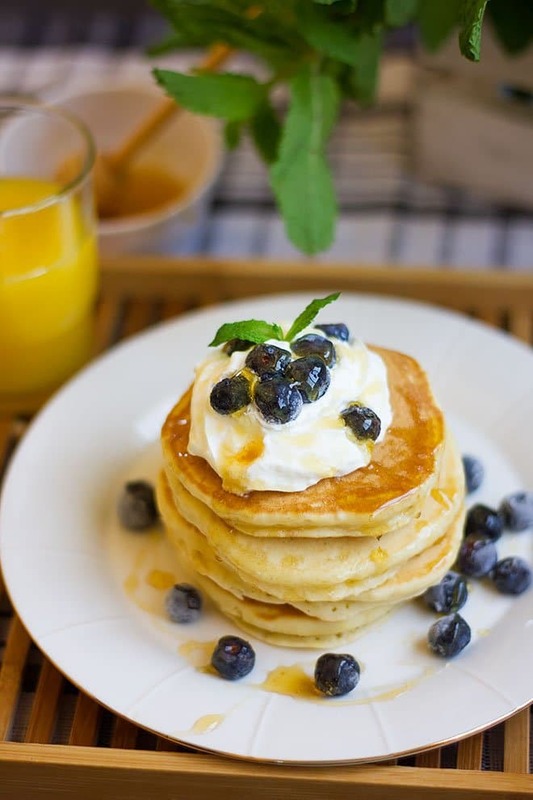 For best results, after you make the pancakes, and when they come to room temperature, place the yogurt pancakes in an airtight container and place it in the freezer. Other ways to store the pancakes in the freezer is by individually wrapping the yogurt pancakes in a plastic wrap and then place all the wrapped pancakes in an airtight container and then place it in the freezer. 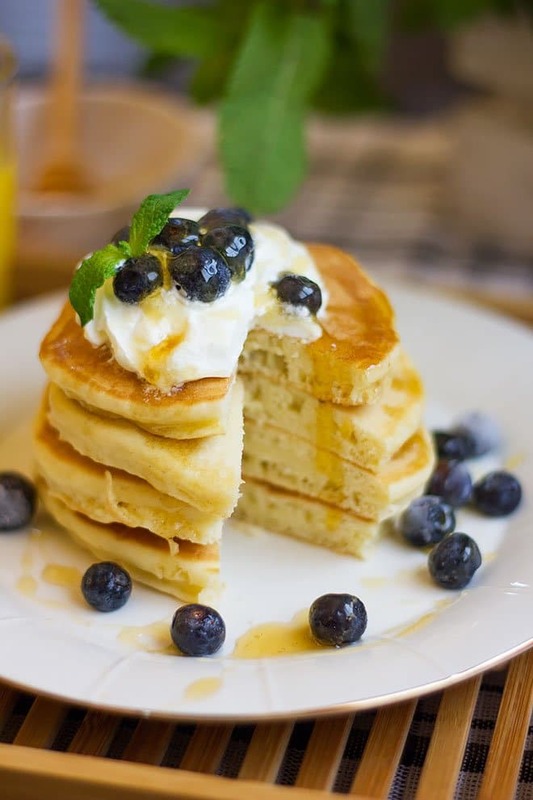 These are fluffy and light yogurt pancakes that are perfect for breakfast or brunch. 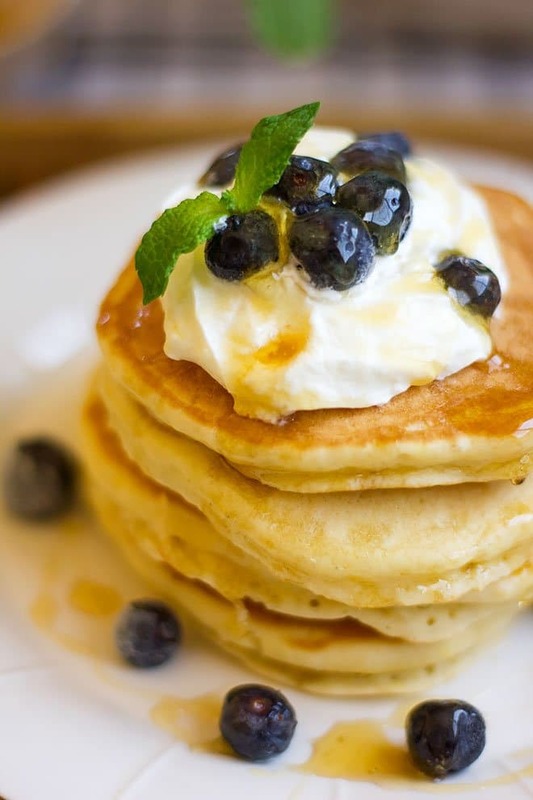 Serve these pancakes with your favorite toppings and syrup. In a bowl sift salt, baking powder, and flour. Keep aside. Beat the egg, sugar, and vanilla until the sugar dissolves. Add the yogurt and water to the previous mixture and beat for two minutes. Add the butter and beat until combined. Add the previously sifted flour to the wet ingredients and mix gently, you might see some lumps but don’t let this encourage to overmix the batter. Take 1/4 cup of the batter and pour over a heated non-stick Pan. If you are not using a non-stick pan, then add a tablespoon of butter to the pan and then start making the pancakes. When bubbles appear on the pancake, flip it. It might take around 2 minutes to cook on both sides when cooking on medium/low heat. Serve the pancakes at room temperature with honey, butter, fruits or any syrup of your choice. To keep the pancakes moist and fluffy, cover while still hot. This post was originally posted in 2010. It’s updated and edited with new images and text. mmm, Good recipe but here shall we can add curd..?? ?